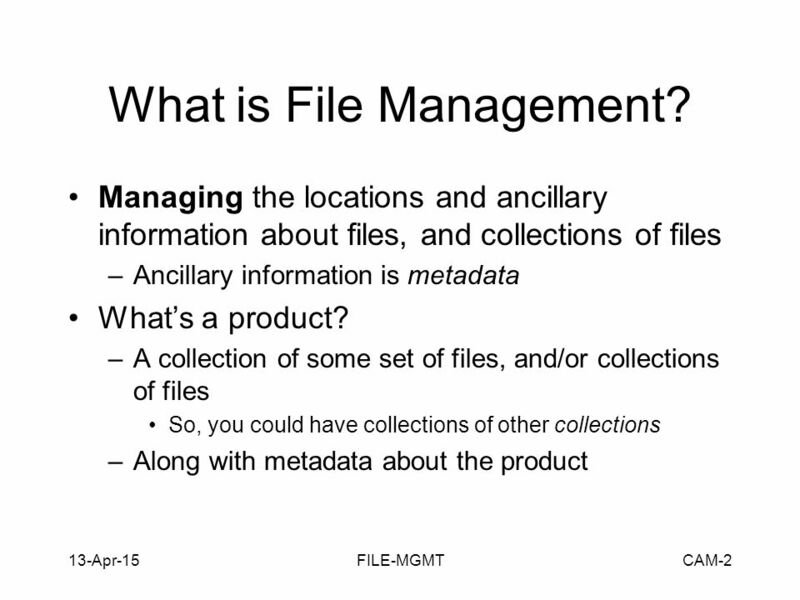 File Management Chris A. Mattmann OODT Component Working Group. 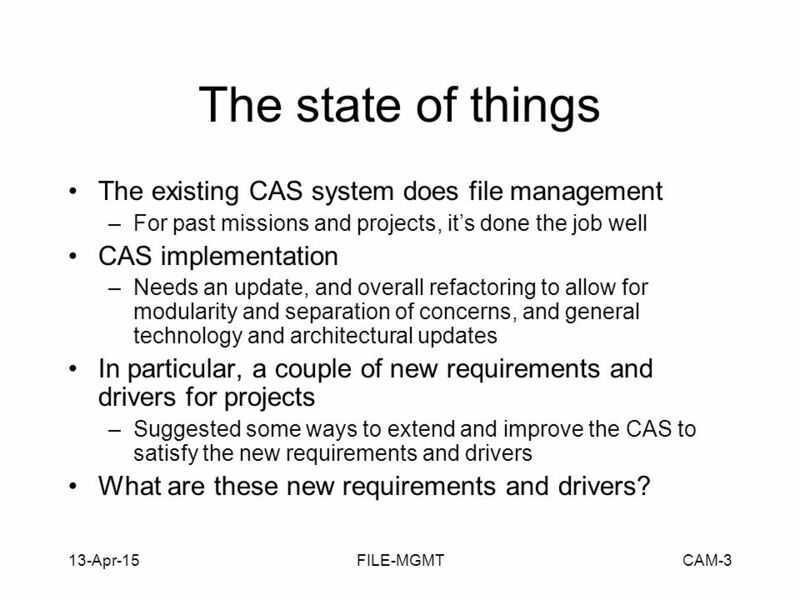 3 13-Apr-15FILE-MGMTCAM-3 The state of things The existing CAS system does file management –For past missions and projects, it’s done the job well CAS implementation –Needs an update, and overall refactoring to allow for modularity and separation of concerns, and general technology and architectural updates In particular, a couple of new requirements and drivers for projects –Suggested some ways to extend and improve the CAS to satisfy the new requirements and drivers What are these new requirements and drivers? 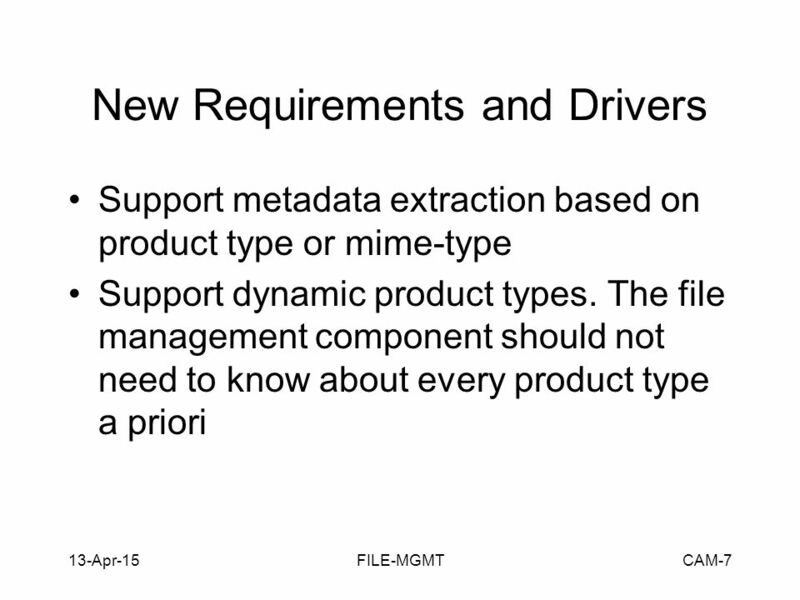 4 13-Apr-15FILE-MGMTCAM-4 New Requirements and Drivers Persisting archived files using dynamic metadata and flexible, adaptable policies based on product types –rather than the monolithic and inflexible existing method of ProductTypeRepository/ProductName/ProductVersion/ as the filesystem location to store products for all product types. 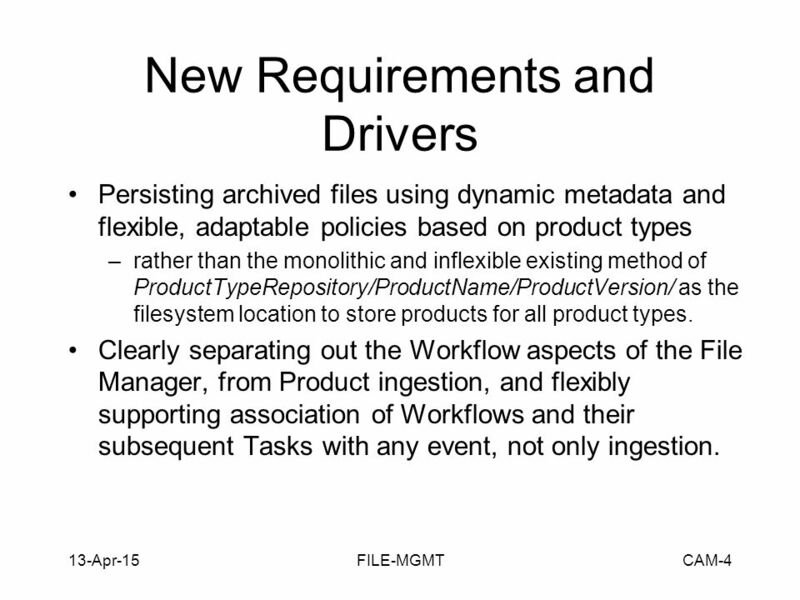 Clearly separating out the Workflow aspects of the File Manager, from Product ingestion, and flexibly supporting association of Workflows and their subsequent Tasks with any event, not only ingestion. 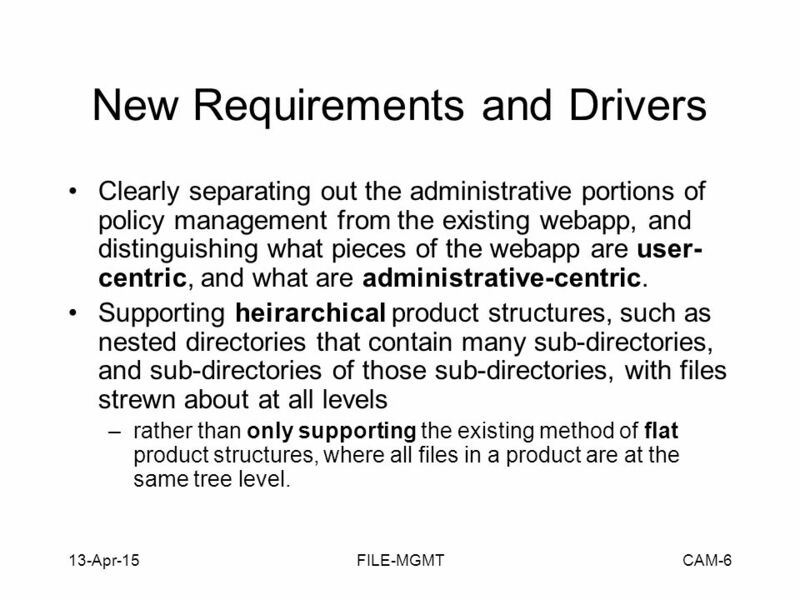 6 13-Apr-15FILE-MGMTCAM-6 New Requirements and Drivers Clearly separating out the administrative portions of policy management from the existing webapp, and distinguishing what pieces of the webapp are user- centric, and what are administrative-centric. 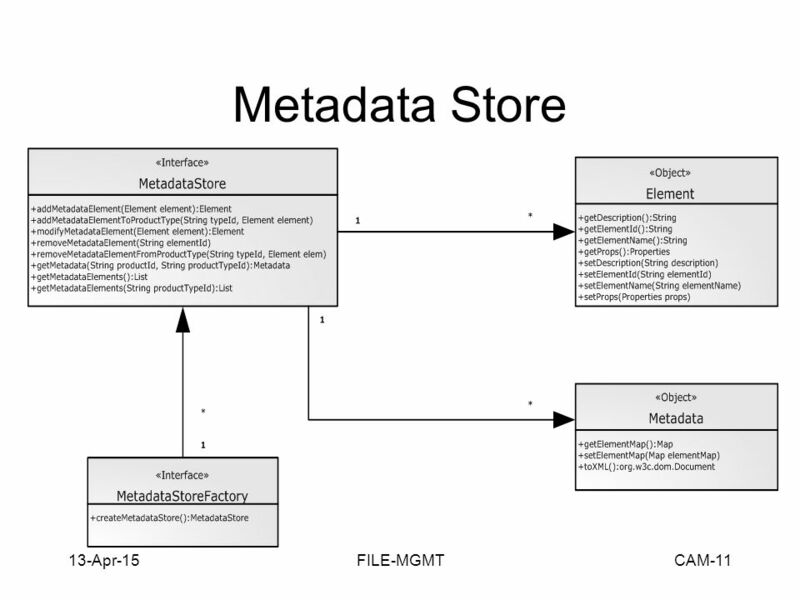 Supporting heirarchical product structures, such as nested directories that contain many sub-directories, and sub-directories of those sub-directories, with files strewn about at all levels –rather than only supporting the existing method of flat product structures, where all files in a product are at the same tree level. 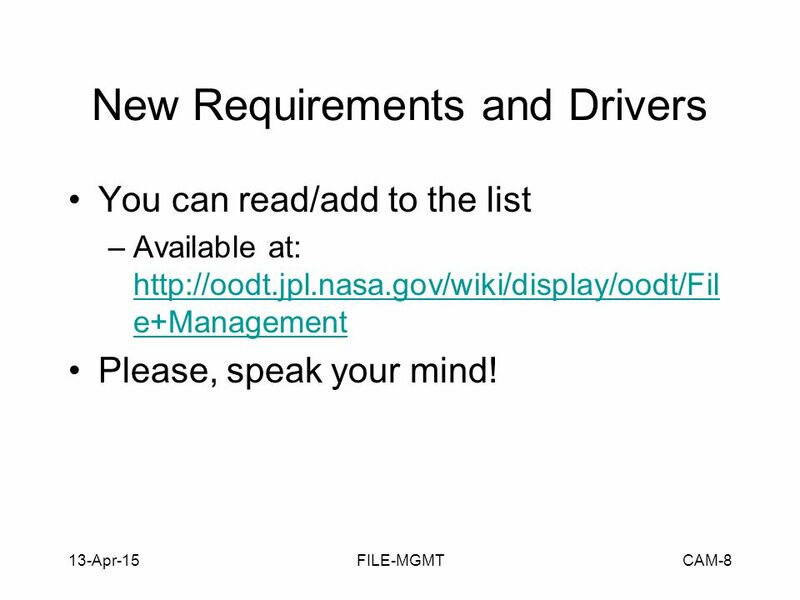 8 13-Apr-15FILE-MGMTCAM-8 New Requirements and Drivers You can read/add to the list –Available at: http://oodt.jpl.nasa.gov/wiki/display/oodt/Fil e+Management http://oodt.jpl.nasa.gov/wiki/display/oodt/Fil e+Management Please, speak your mind! 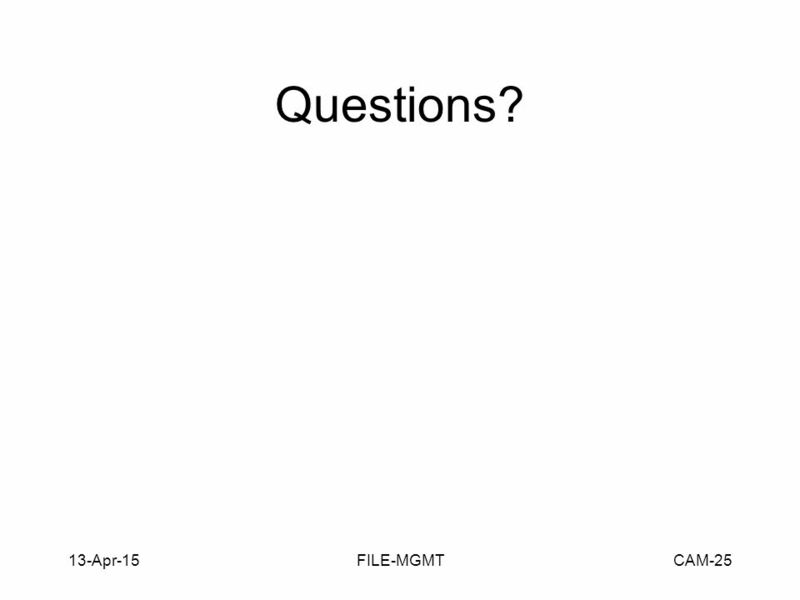 15 13-Apr-15FILE-MGMTCAM-15 Transferring files How does the transfer actually occur? 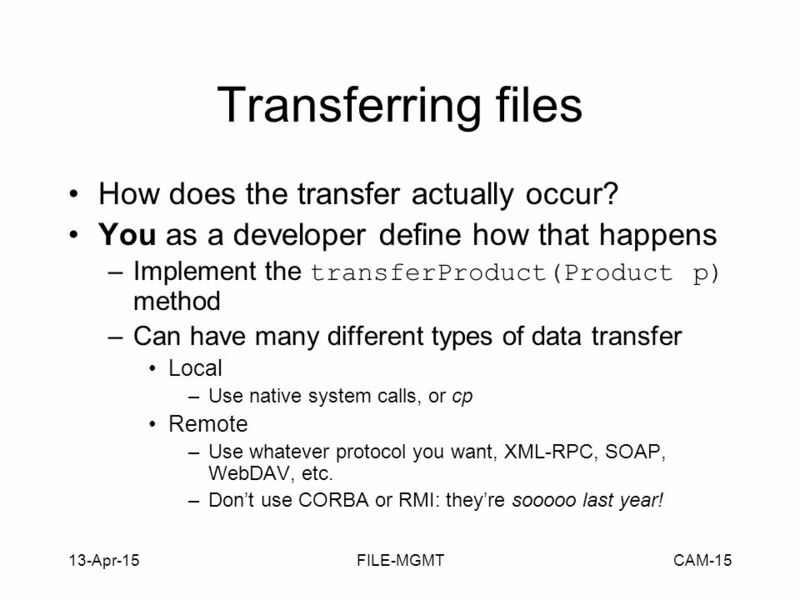 You as a developer define how that happens –Implement the transferProduct(Product p) method –Can have many different types of data transfer Local –Use native system calls, or cp Remote –Use whatever protocol you want, XML-RPC, SOAP, WebDAV, etc. 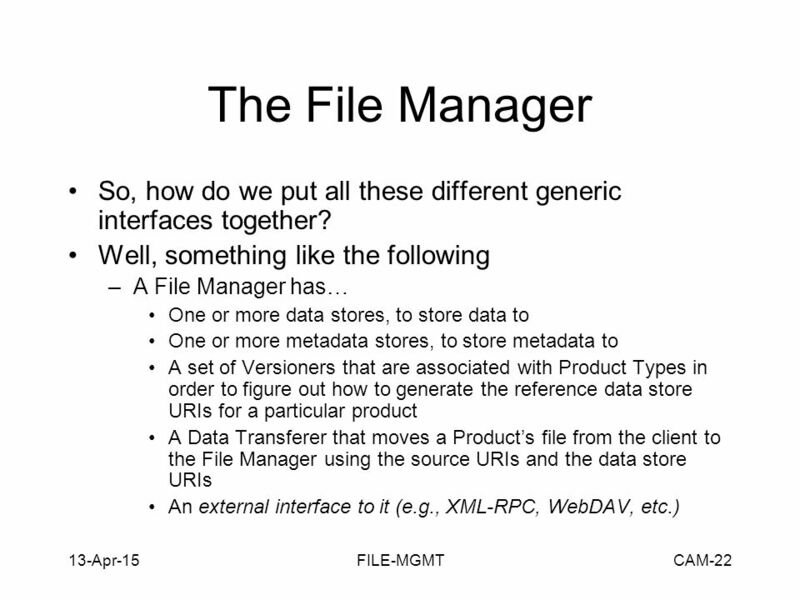 –Don’t use CORBA or RMI: they’re sooooo last year! 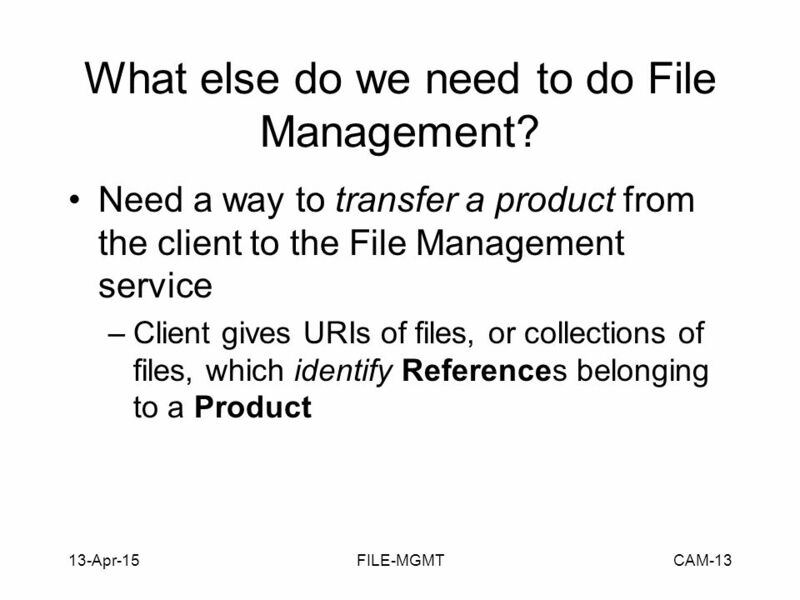 16 13-Apr-15FILE-MGMTCAM-16 Translating the URIs Translating the URIs from the client to the File Manager presents an interesting challenge –For example, where should file:///home/chris/myfile.file be transferred to on the File Manager’s system? 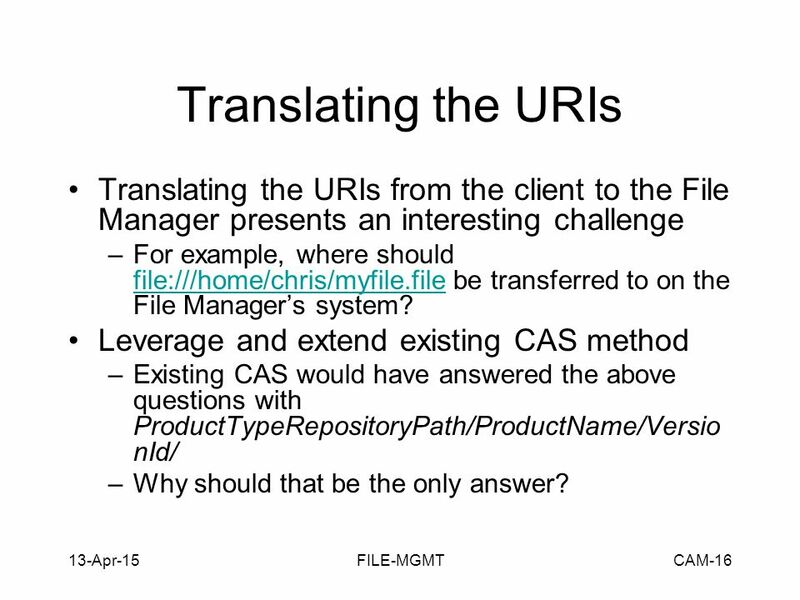 file:///home/chris/myfile.file Leverage and extend existing CAS method –Existing CAS would have answered the above questions with ProductTypeRepositoryPath/ProductName/Versio nId/ –Why should that be the only answer? 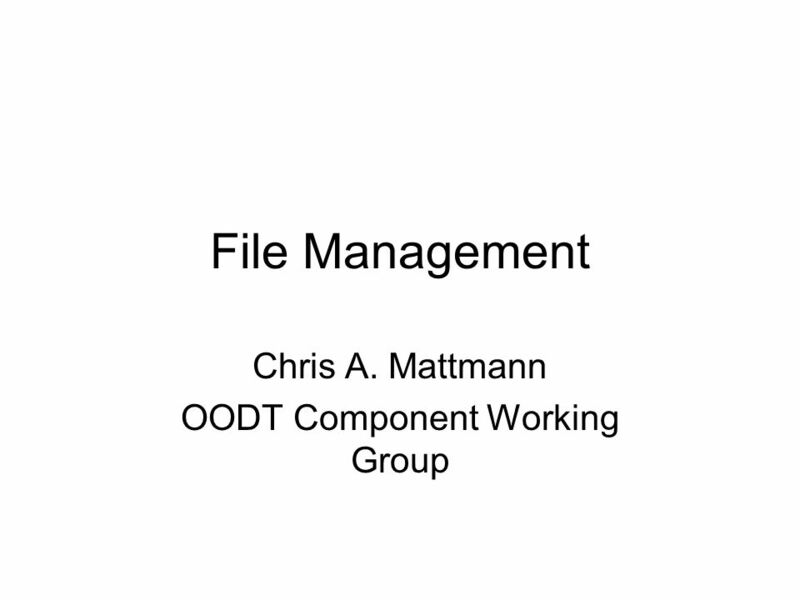 Download ppt "File Management Chris A. Mattmann OODT Component Working Group." 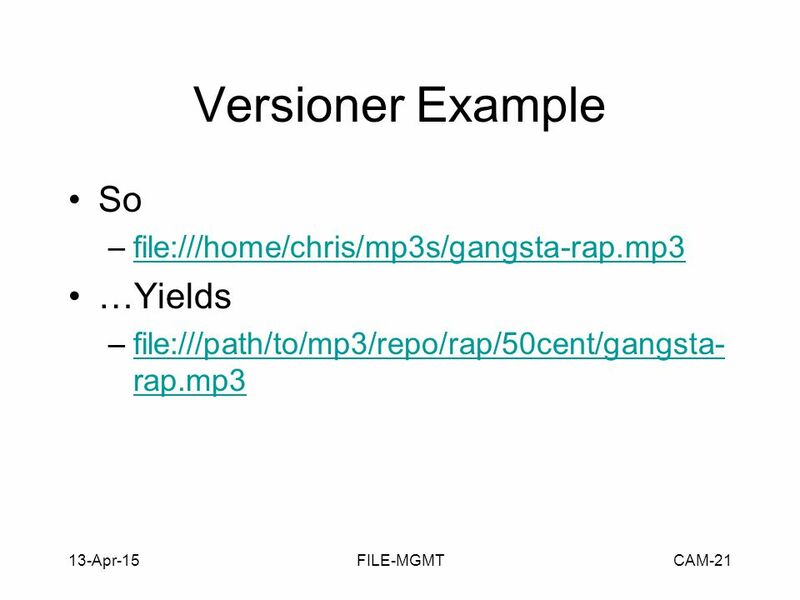 Introduction to Java 2 Programming Lecture 10 API Review; Where Next. CTS2 DEVELOPMENT FRAMEWORK CTS2 Overview. Schedule What is it? Why a framework? What does this do for me? Plugins Implementations available now CTS2 Compliance. 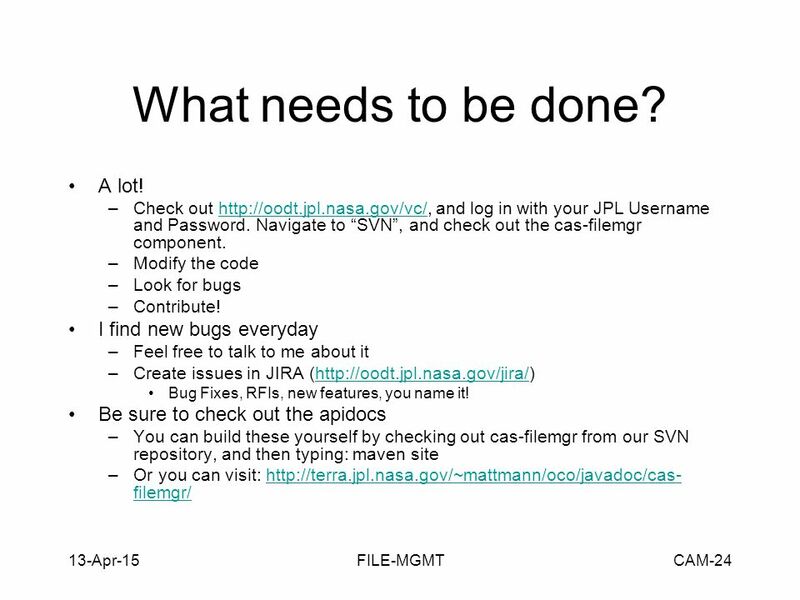 Exploiting Reference Architecture to Guide the NASA Earth Science System Enterprise Chris A. Mattmann NASA Jet Propulsion Laboratory University of Southern. Unveiling ProjectWise V8 XM Edition. ProjectWise V8 XM Edition An integrated system of collaboration servers that enable your AEC project teams, your. 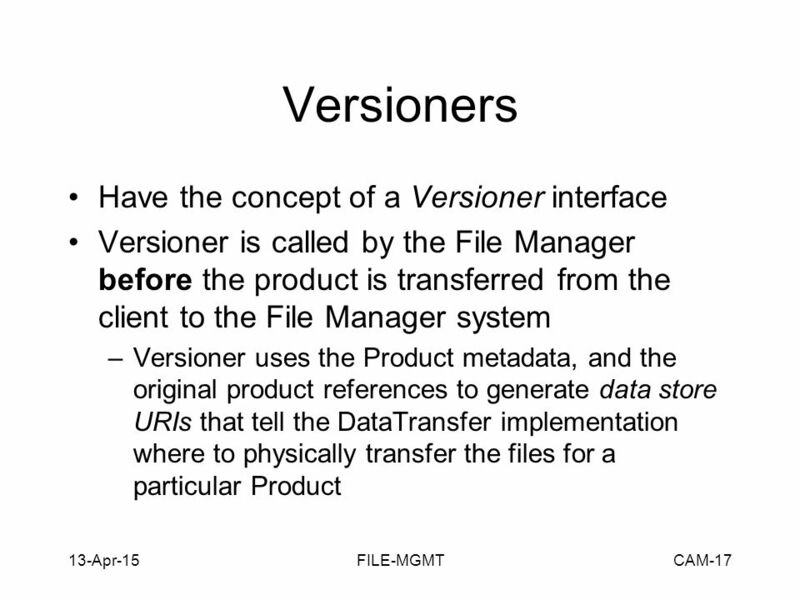 Version Control System (Sub)Version Control (SVN). 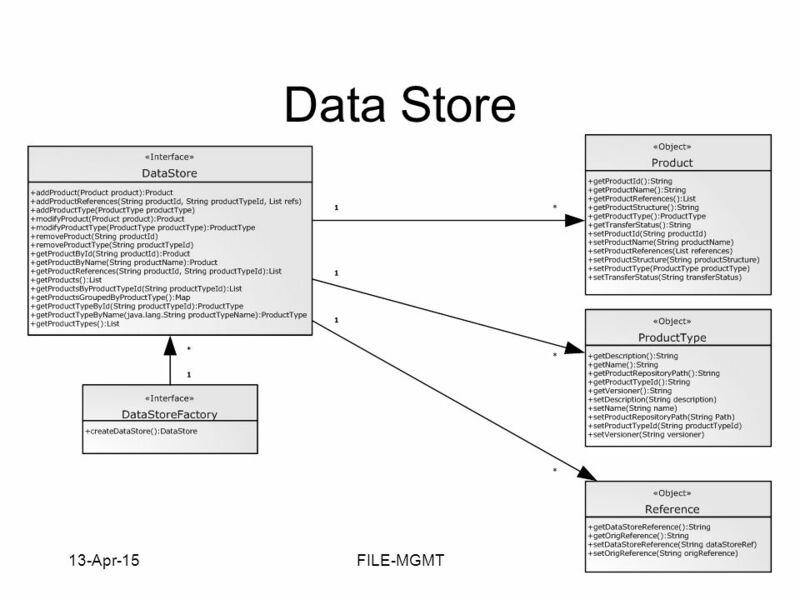 1 OBJECTIVES To generate a web-based system enables to assemble model configurations. to submit these configurations on different. 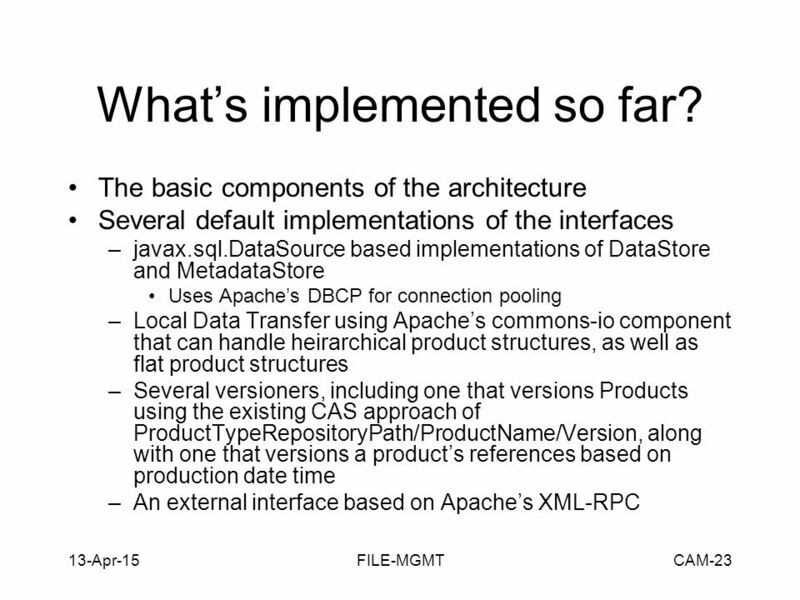 Java development infrastructure at FMI Pekka Rantala FMI. Depositing e-material to The National Library of Sweden. 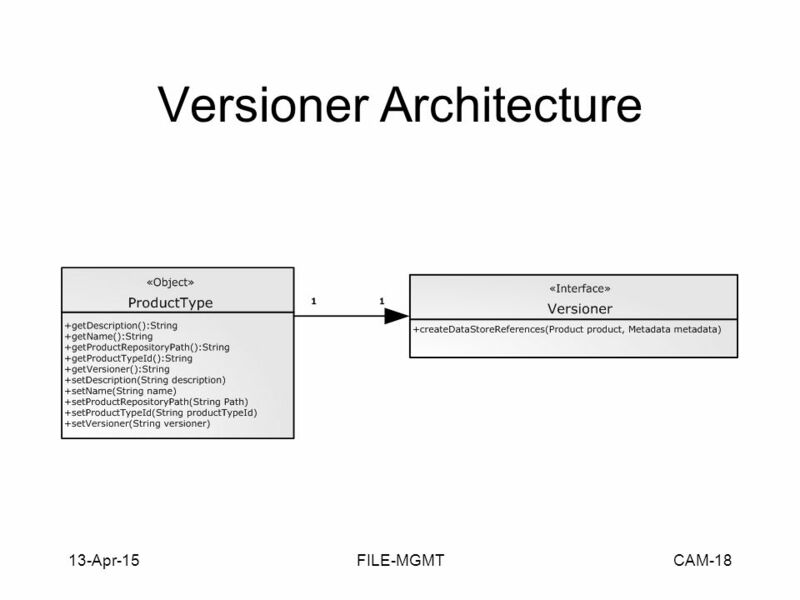 Object-Oriented Enterprise Application Development Tomcat 3.2 Configuration Last Updated: 03/30/2001. 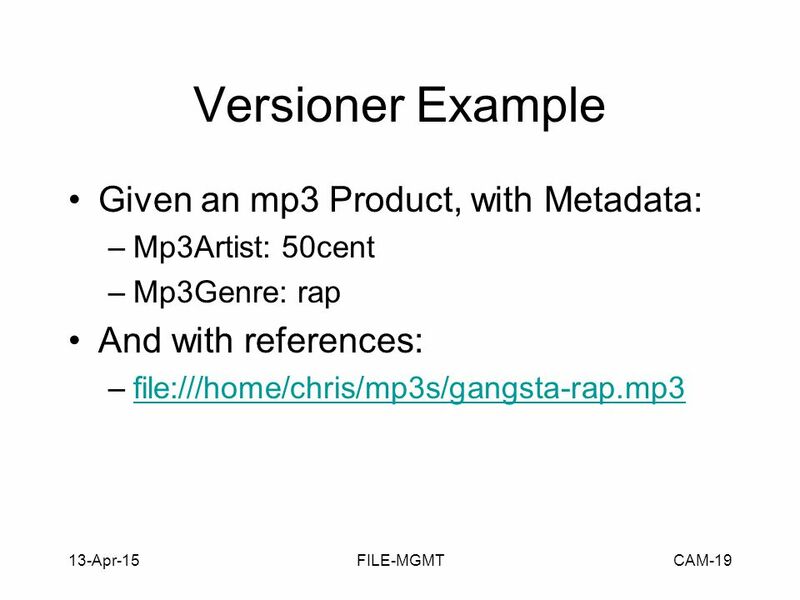 J4www/jea Week 3 Version Slide edits: nas1 Format of lecture: Assignment context: CRUD - “update details” JSP models. Operating Systems Concepts 1. A Computer Model An operating system has to deal with the fact that a computer is made up of a CPU, random access memory. 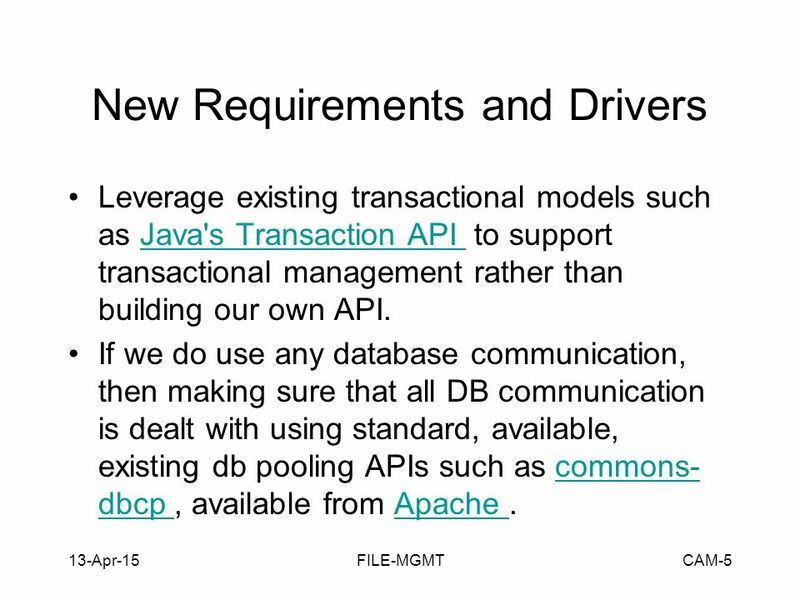 Confidential ODBC May 7, Features What is ODBC? 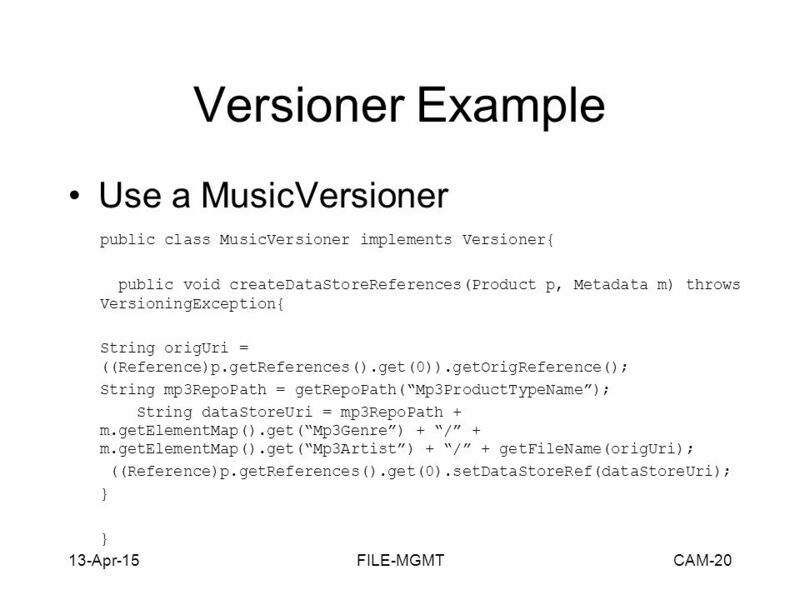 Why Create an ODBC Driver for Rochade? How do we Expose Rochade as Relational Transformation. 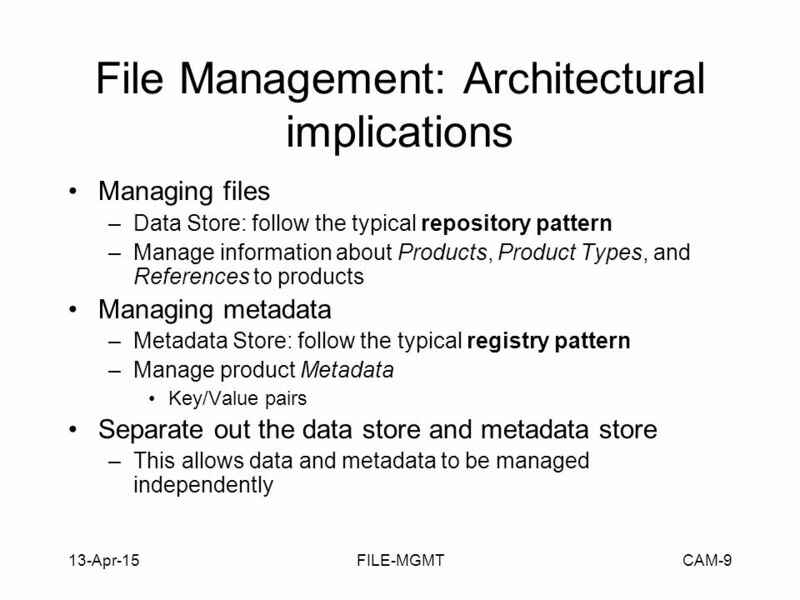 Chapter 25 More Design Patterns. 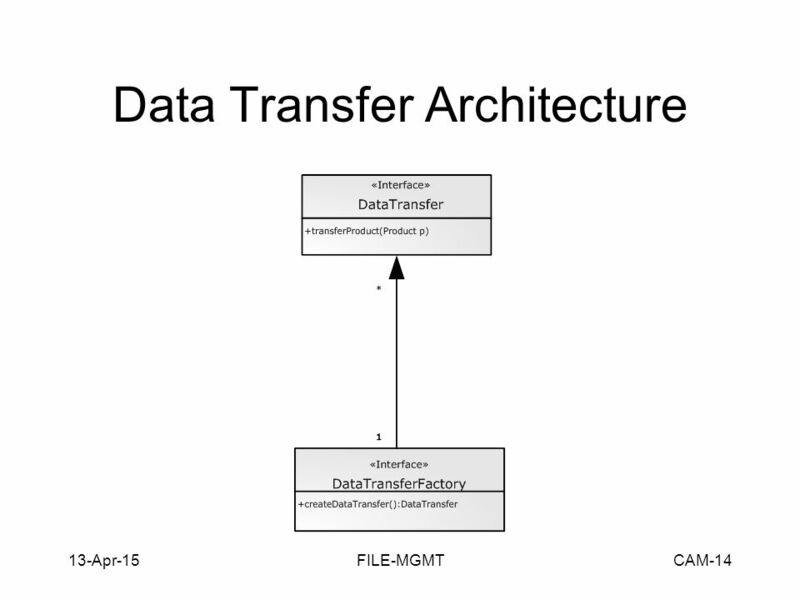 Web server and web browser It’s a take and give policy in between client and server through HTTP(Hyper Text Transport Protocol) Server takes a request. Simulation Production System Science Advisory Committee Meeting UW-Madison March 1 st -2 nd 2007 Juan Carlos Díaz Vélez.